I currently have a document web part on my home page with a few folders with documents in each of them. When I click on the folders, the documents show as they should. However, I would like when I click on the folders, that it would link to the document page (takes up the whole page and shows the documents), instead of showing the documents in the quadrant that I currently have it in? Is that possible to do? I know when I click on the "Documents" Web part title, it does go to the documents page, but I would like the folders to direct to the page as well. Help please.. If you want these kind of web part, you must code it. There is not any OOTB web part which directing to the SP library folders. Probably you can try use Search Content Query - Web-Part. this way you will have links on Folder Names to the library, but you must try it if it suits your vision. 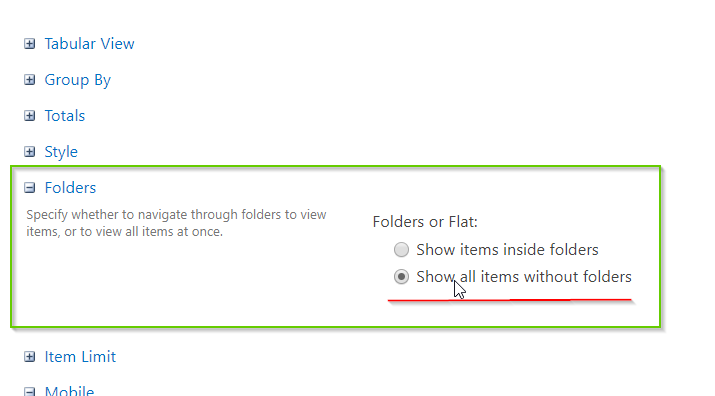 I am not sure if I have understood your question properly, but, if you want to show the documents without the folders then you can create a new view and choose 'Show all items without folders' option to flatten it out. Like below. Let me know if you are looking for something else, and share a screenshot if possible. Not the answer you're looking for? Browse other questions tagged 2013 web-part document-library document or ask your own question.